Welcome to the Dwarf Fortress Map Archive (DFMA). 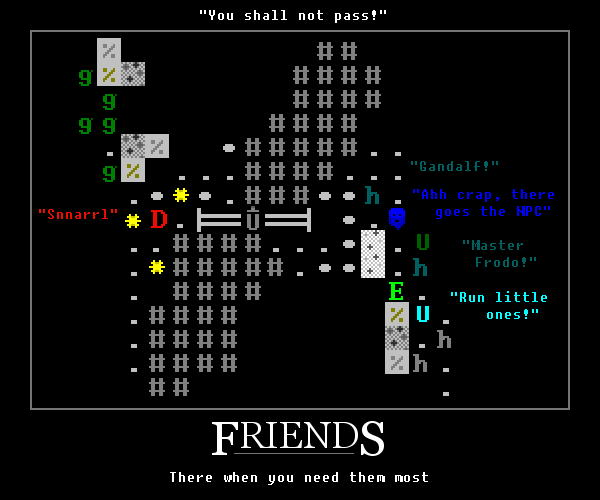 Dwarf Fortress is a popular single player sim game, (still in ALPHA mind) made by bay12games. This here website is a repository and online viewer for player created maps exported from the game. The site revolves around an optimized file format (.FDF-MAP), which can produce files 1/2000th the size of the ouputted bitmaps (for a 28 layer map) and 1/20th the size of equivalent PNG files. This makes them small enough to upload and transfer across the web without chewing up bandwidth. God forbid someone trying to upload the 150MB output file from a midsize fort, we can deliver exactly the same map for ~100kb!. This site is for uploading and sharing (viewing) maps from Dwarf Fortress with your friends, family etc.. I'm sure you'll figure it out. Also look out for Points of Interest; created by users of the archive, each map can have a navigatable list places that describe the fortress or world. I've updated the link to ShadowLord's DF Map Compressor to its new home on the bay12games Dwarf Fortress File Depot (DFFD). Thanks to Dwarf Comic for highlighting the broken link. Applied a 32 password character limit to signup, registration, and login; to address a bug with long passwords locking people out of their accounts. Please get in contact if you encounter any login issues. Passwords are salted, hashed, and stored in our user database. Passwords can be changed/updated from your user profile page after signing in. Removed the CMV warning from the Add Movie page; thanks to lethosor for spotting the message was out of date. The Map Archive is causing heavy load on our shared host, so I've enabled page caching on several sections of the site. This has also meant I've had to disable comments for non-authorised users. If you want to comment in future you'll have to sign-in / sign-up for an account. If this saddends you, please get in touch, tweet me at @Markavian or send me an email dfmapleasenospam@me.net@mkv25.net. If you encounter any bugs with caching, such as submitting maps, or viewing pages, please get in touch and let me know. Maps archived for another year. Ban list updated to include some new words. Continued thanks goes out to dedicated reporters for finding and identifying spam. Err, so its been a while, but here's an update! Good news - hosting for the site has been renewed for another two years, that'll bring mkv25.net up to 2015!, and means that the site has been running for 11 years now. CMV Editor source code now available on Github: https://github.com/Markavian/CMV-Editor. Any budding C# developers out there who want a tinker, go right ahead. All the solution files, IO encoder/decoder classes, and timeline component are there to be tinkered with. And lastly, thanks to all the spam reporters who help keep the site clean of ANKFSL$52LFSDFS, "Nice blog", and shoe adverts, your help is much appreciated. Fixed bug with PoI links not working on maps with a default PoI set. Thanks to hyndis for reporting the bug; completely missed it. Movie update, RE: "Movies no longer record properly, at least in the SDL versions. The recorded files have no content at all, consisting of single frames." (0013891) Toady One (administrator) 2010-11-15 13:59 This should be fixed for 0.31.18. Get out there and make more movies! Added feature to look for a Default point of interest in other maps in the same series if one is not defined. Should help people who upload multiple maps and don't want to have to set a default point of interest for every map entry. Thanks to Rhenaya for sitting me down and sorting this out for me. Also; increased the max file size for map uploads to 1 MiB for registers users, and 628 KiB for non-registered users. Important: Do not upload movies recorded with 0.31.12 non-legacy, because they don't work at all. This error has already been reported in the tracker, bug 2489 - the movie files are corrupt and will display blank when uploaded to the DFMA movie player. The favourites page now correctly groups maps across their histories, giving a truer picture of the most favourite maps. I've added created a Random Movie picker, similar to the Random Point of Interest box, and moved the box on the front page to top right corner. Received word that Safari on the Mac also has problems uploading fdf-map files, as does Google Chrome - I know what the problem is but am unwilling at present to reduce the security on uploads. I am somewhat dissapointed with Safari and Google Chrome for breaking my site. Added [+] symbol to Upload Map and Upload Movie on site links. The 10,000th point of interest was posted not so long ago. Reminder: For "open ended" Point of Interest sharing, you just need to check the PoI Sharing box. Fixed bug with 's breaking map and movie uploads, appologies to Vetarnian for discovering this one. ... and I hope no one minds, I've tweaked the stylesheet to give the site more contrast. Added: "Here is a list of all of our favourite things... "
Added activity stats for maps, movies and comments over the past week and last 12 months on the recent activity page. Name links around the site, on comments, maps, and recent activity will now take you to a user profile page showing stats and recent posts by that user. This is a good way to find out more about different users on the archive, whether they are registered, what their favourites are, and what their recent activity has been. Removed endless list of movies alongside ungrouped movie clips. Links to the page can be found on the left "Report problem / contact" or from below map entries "(Report problem)"
Thanks to SL for his great DF map encoder/compressor, without which I would not have had the inspiration to build this site. Also thanks to him for modifying his program over and over to get it to work with my Flash viewer. The Flash map viewer was created by Markavian, aka John Beech. An avid fan of DF and computer programming. Markavian has been working with web technologies such as PHP, MySQL and Flash for over 6 years, in an effort to make the web a more useful place. Bay12Games: (bay12games.com) - Official forums, updates, dev news, and other fun games!